John R. Connolly (right) and rival Martin Walsh both attended the Men of Boston Cook for Women event in Codman Square on Thursday. 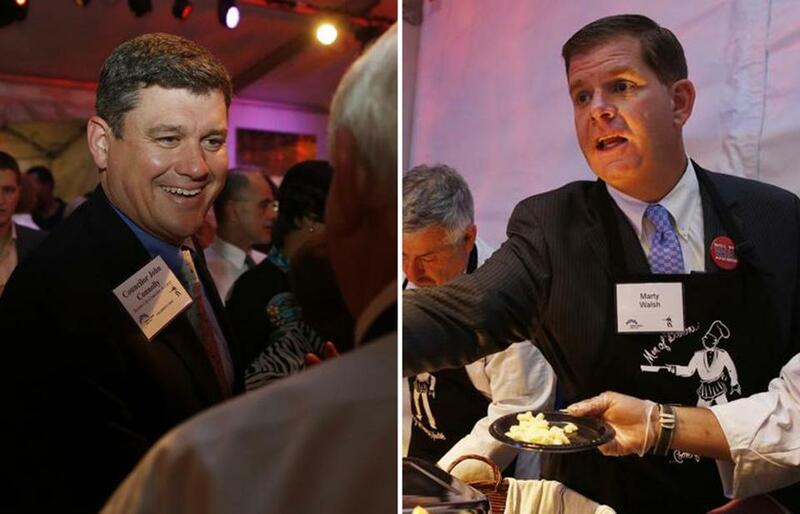 It took just two days for Boston’s mayoral campaign to transform from tepid to tense. The newly chosen finalists, Councilor at Large John R. Connolly and state Representative Martin J. Walsh, clashed Thursday for the first time, with each calling the other a flip-flopper and with Walsh suggesting that Connolly cannot always be trusted. At issue was whether to take the so-called People’s Pledge against accepting funds spent by special-interest groups on a candidate’s behalf. Within hours, Walsh struck back, rejecting the pledge against outside funding, and questioning whether Connolly could be trusted to honor such an agreement. That was a reference to Connolly’s handling of a similar pledge during the preliminary race, when he had initially called it a “political gimmick” as outside groups spent tens of thousands in support of his run. But Connolly switched course in August, telling Stand For Children, a national education advocacy group, not to spend $500,000 it had offered on his behalf. A People’s Pledge aims to prevent the flow of money from political action committees, labor unions, and other special interest groups. The groups often spend money on behalf of candidates they have endorsed. By spending the money directly, rather than donating it to the candidates’ campaign accounts, the groups evade campaign-contribution limits dictated by federal election laws. Calls for candidates to take such pledges have been commonplace in Massachusetts elections since Scott Brown and Elizabeth Warren agreed to one during their 2012 race for the US Senate. Under such a pledge, candidates ask outside groups not to spend money on their behalf and agree that if an outside group spends money, they will donate a matching amount to charity. As has been done previously in Massachusetts races, Connolly’s vow to take such a pledge was contingent on Walsh signing on. The Connolly campaign pointed out Thursday afternoon that Walsh told voters at a July campaign event that he would be willing to take such a pledge if all of the other 11 candidates in the preliminary race did so as well, according to video of the event obtained by Boston Magazine. Walsh’s refusal to sign the pledge opens the floodgates for potentially millions of dollars worth of campaign mailers, television commercials, and paid canvassing to be spent by outside groups on behalf of both candidates. affiliated and labor-supported groups such as UNITE Here, American Working Families, and Working America, which on Thursday reported spending another $40,000 on his behalf. In total, Walsh has received more than $750,000 in outside spending on his behalf during the course of the mayoral campaign. Connolly, meanwhile, is likely to see an influx of spending by national education reform groups, including Democrats for Education Reform and Stand for Children, both of which spent money on his campaign during the preliminary race. The two groups spent a combined $63,000 on his behalf during the preliminary, but all of those expenses seemingly came before he swore off outside money in late August. or not it plans to commit another large sum of money to Connolly if his pledge attempt failed, the group is widely believed to have more than $1 million at its disposal to support Connolly. “Voters will have a clear choice on Nov. 5 and the opportunity to elect a mayor who will make quality public education the number one priority of his next administration,” Jason Williams, executive director of Stand for Children Massachusetts, said in a statement to the Globe on Wednesday. Globe staffer Joshua Miller contributed to this report. Wesley Lowery can be reached at wesley.lowery@globe.com. Follow him on Twitter @WesleyLowery.